Sergio Blanco empties fruit and vegetable scraps to be composted. Earth Day only comes once a year, but thanks to the Office of Sustainability Philadelphia is trying to be nice to the planet year-round. So far, the city's Greenworks program has been making some headway by sticking to the three R's: Reduce, Reuse, Recycle. Among other benchmarks, the city exceeded its goal of diverting 70 percent of waste from landfills in 2012 (the most recent year for which such data is available) by three percent, up 20 percent from 2008. That year curbside recycling rate reached an all-time high of 21 percent. Though our recycling rates are slowly climbing, the final frontier of waste reduction is really the "Reduce, Reuse" part of the mantra: composting. Yes, a dirt-like substance which many would describe with choice words like "gross," "smelly," or "icky," is vital if Philadelphia truly wants to become green. Compost is the nutrient-rich material created by the natural decomposition of organic matter. In other words, it's like Miracle Grow made out of the banana peels, egg shells and corn cobs you usually just throw in the garbage. Rather than send it to a hole in the ground to forever emit greenhouse gases and slowly poison the earth, residents can compost these items into a lush soil amendment for growing new fruits and vegetables. It may seem like table scraps and yard trimmings couldn't really amount to much. But when San Francisco began researching citywide composting options (it's now mandatory for San Franciscans to separate compostables curbside) they found that over one third of landfill waste could have been composted instead. In addition to reducing landfill waste and harmful methane emissions, compost is often better for growing plants than store-bought fertilizers, not to mention cheaper. 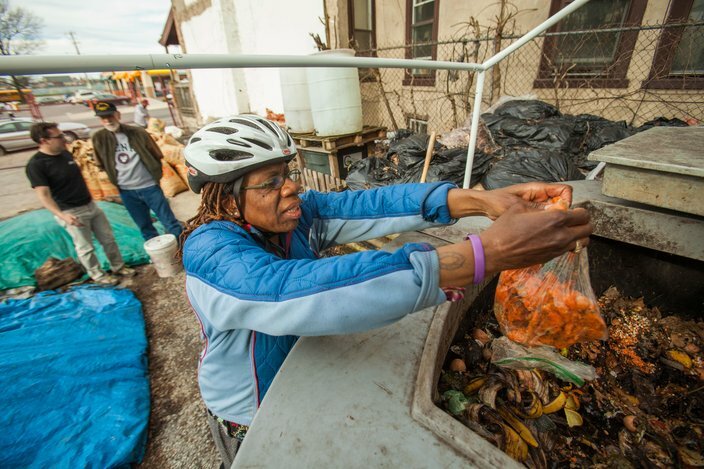 Cities like Portland and Minneapolis have launched transformative curbside composting programs, so why doesn't Philadelphia? The short answer is, City Council is looking into it. Such large-scale programs are often expensive and difficult to implement. We could be waiting quite a while for curbside pickup of organic waste. 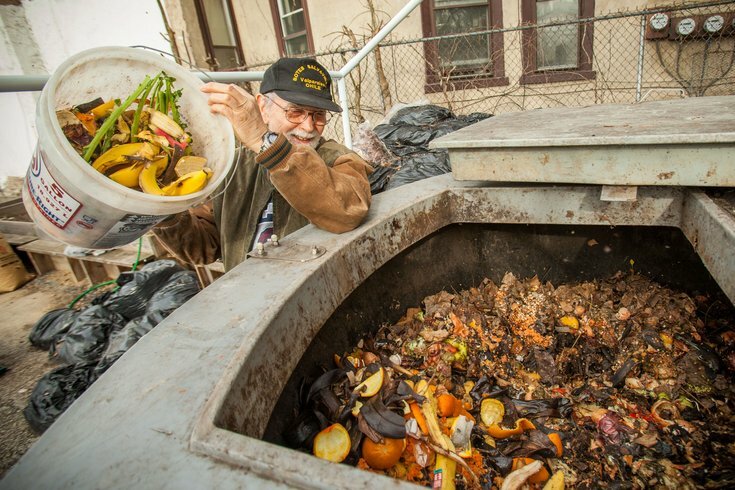 Luckily for eco-conscious Philadelphians, composting is inexpensive and easy to do. The one thing you need for at-home composting is enough space to do it. If you're lucky enough to have a small backyard, a porch or even a stoop, you can make a composting setup to fit your space. According to this handy guide by the Environmental Protection Agency, an ideal spot should be at least one cubic yard, though they can be smaller or larger if maintained well. If you have the luxury of choosing a spot in your outdoor space, pick a shady or partially shaded dry area. Your mix will need a certain amount of controlled moisture, but too much water from rain or poor drainage will make it moldy. If you can, Seth Budick of University City composting facility The Dirt Factory suggests placing your compost away from any doors or windows; compost smell is easily controlled, but it will usually give off a bit of scent. To contain your compost, you can either choose an airy pile on the ground, perhaps bounded by chicken wire or wood, or a closed container. If you intend to use food scraps in your pile -- rather than just yard waste like leaves, twigs and grass clippings -- you must have a closed container. Otherwise it will attract animals and the smell will travel. A variety of containers available online are made for composting. Lidded garbage cans with holes drilled into the sides for aeration and drainage work. Budick also notes some Dirt Factory visitors use old cat litter tubs for easy transportation. Next, you'll gather materials for your compost. Organic waste can be categorized into two types: "brown" and "green" as in the table below (Source: EPA). You'll want three parts brown to every one part green material in order to balance the carbon (browns) and nitrogen (greens) content of your pile. Alternate layers of this material and be sure to stir your compost with a pitchfork or shovel each time you add new material. This keeps it oxygenated, allowing the micro organisms that break down organic matter to live. Be sure to break up larger, tough items (like flower stems or newspaper) into smaller pieces so they can decompose easily. 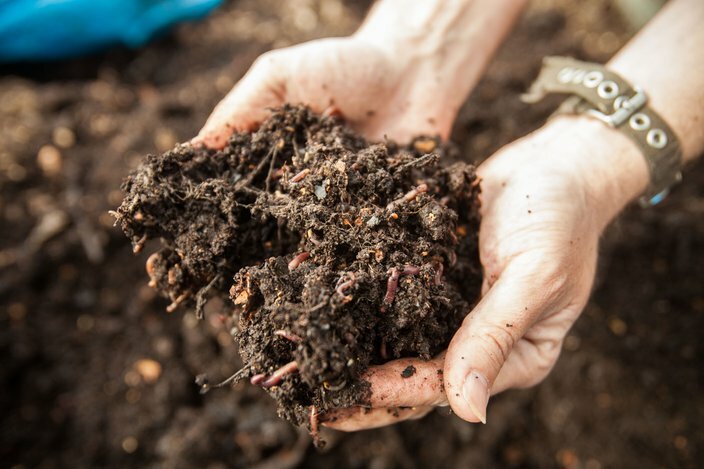 Over the course of four to eight weeks, depending on your pile size, your compost will become hot to the touch (which means it's working) and decompose, usually with the help of worms and bugs that work their way in. Soon it will become a fine, dark and fluffy material called humus (no, not like the food). Add your newly minted compost to soil beds and gardens and watch nature work its magic. If you have little to no outdoor space at your home or apartment, storing organic waste to be composted at another location is the solution for you. All you'll need is a sealed container in which to store table scraps. Rather than choosing an aerated container, Budick said you'll want a closed bucket or bin in order to keep odors and smelly liquid runoff to a minimum. You'll want to be able to store a week's worth of organic material. For most families of four or less people, Budick said a five gallon bucket will suffice. For big vegan or vegetarian families, a larger container may be required; however, many sites like The Dirt Factory have drop-off limitations of five gallons per week. Containers can be kept by your regular garbage bin or under the sink, Budick said. If you're fortunate enough to have a small outdoor space like a stoop, he suggests keeping your container outdoors in the winter months or in a freezer in warmer months to minimize odor. For those storing smaller amounts of food, Budick suggests throwing it in a big plastic Ziploc to keep in the freezer. When your container is full, bring your waste to your nearest composting site. Many sites have specific guidelines for the materials they will accept and some only accept yard waste, so be sure to follow the rules. Frequently, when compost is ready, sites will provide the fresh stuff to community members for free or donate it to community gardens. The Dirt Factory is the ideal example of these community-run composting sites. Members of the University City community have become regulars, dumping their material into giant UCD-managed tubs each week. It's been open for nearly three years and currently has over 25 customers each week, many of whom come in from a half-mile radius around the site. When they kick off the spring season Saturday, May 2, The Dirt Factory will open up its gates for the community so they can, ahem, dig in to completed compost for their personal use. Any leftovers go to UCD for general beautification and landscaping. Curbside organic waste collection like Bennet Compost and the suburban Kitchen Harvest exist for those without a close-by composting site. They'll dispose of your food waste without the hassle of having to lug it about town. Commercial companies like Philly Compost and Organic Diversion will tow away bigger loads from businesses and institutions, too.